My first and only experience with animator Robert Morgan beforehand was with his entry for The ABCs of Death 2 (2014). Called D is for Deloused, it's one of the best of the entire film with its nightmarish qualities. Indebted clearly to directors and follow animators such as the Quay Brothers, Bobby Yeah nonetheless has its own aesthetic style that here in managed to be even more disturbing and absolutely revolting at times. Animation that I love are about the senses of the viewer being brought up front and centre, whether it's the style and aesthetic of two or three dimensional animation, or the tactile nature of stop motion; whether they have elaborate narratives or not, are realistic in their character designs or the exact opposite, the best (and usually underappreciated) examples are in tune to a highly rich and carefully crafted production. 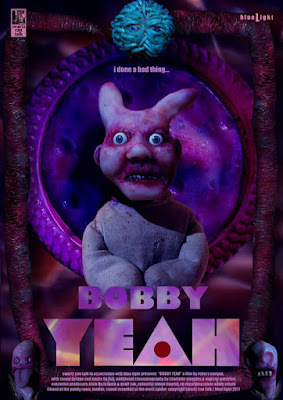 Bobby Yeah follows a simple narrative journey - the titular Yeah, a humanoid with what only can be described as flesh bunny ears, steals a pet from another figure only for his curiosity to press a button that appears on its back to lead to a series of grotesque events, freakish monstrosities at his door and more buttons he cannot help to push. The result, a three dimensional series of rooms in which the action takes place in, is the horrible cross breeding of a textiles class project with Cronenberg body horror at a meat counter of a butchers. Utter monsters populate the screen mixing doll-like figure, pure pounds of flesh or pink clay and human anatomy in their DNA, the most disturbing of the lot (and the most disturbing thing in horror for me for a long time) being a full sized and exceptionally realistic human face that writhes about with a tail like body. What adds to this horror as a counterbalance, making it more unsettling, is both the stop motion nature of the figures, made by hand and shakily moving about in spasms, and the inclusion of textiles that evoke innocence in a deeply inappropriate way, the cloth clothing of Bobby Yeah or the bubblegum pink felt fur lined walls of the figure - a cross between an angel beanie baby and a flesh freak - the pet was stolen from. The disturbing nature is to go as far as add explicit sexual aspects to the creatures, of giant sperm with red string tails, the birthing of an egg, and a literal tripod with a bird's head plonked on top of a mass of armless gangly sausage. The content is, despite the apparent horror of it all, of a very English take on what fellow animator Jan Svankmajer did with found objects, re-use and emphasise their traits in age and look in the characters he made from them, the Englishness from the specific objects used - this manages (just for me) to get away with having a head of a golliwog doll being used because, originally a bird's on the tripod, its stripped from its racist symbology and is amongst a menagerie of disturbing figures, and it wouldn't be surprising if Morgan knew the inherent issue of this when he made to decision to use, even use this fact to add to the disturbing use of the head for that particular character. It's surprising how much explicit content it gets away with as a BAFTA nominated animated short, compared to how a live action version of this material would get a strong reaction in reviews, unrealistic figures appearing to still have life and a tangibility to them that makes the material still disturbing to witness, but there's a lot of sick humour and deliberate weirdness to the proceedings as well. A sudden sprint through live action countryside, brief, is disarming yet strangely hilarious whilst Yeah's obsession with pushing buttons, his fatal flaw which leads to the plot happening in the first place, skewers fairy tale morality. As a result, the film clearly defines, as the project of his that's the longest in length, a distinct style for Robert Morgan as an animator and director. Like many animated shorts - Svankmajer's, the Quays, even Looney Tunes and directors like Chuck Jones - their plastic realities are inherently abstract where, even in realistic looking films which use real locations, one is forced to adapt to the reality shown. Especially with stop motion, the process of creating figures and having to move them inch-by-inch to create life in them, there's an inherent artificial bubble from the disconnected movement and hand-made qualities that force you to re-assess their reality immediately. The figures and world of Bobby Yeah beyond this also have a distinct visceral nature to them, which slither and crawl along the ground, adding to this disconcerting nature. Also there's the psychedelic tone of the short beyond the animation, its music by ZnO almost atonal at points and even a kaleidoscope series of colours being used a few times including in a freak-out transformation sequence, their inclusion with the use of textiles disarming in how they seen inappropriate on the surface to such scenes but fitting perfectly after this is registered. Absolutely squirm inducing in all the right ways. Whether Robert Morgan can be able to extend a project of his in the future into feature length is unknown, but four years worth of hard work on Bobby Yeah is visible and incredibly accomplished.